Baseball’s Spring Training is upon us. With players getting in shape for the long season ahead of them, we would like to invite homeowners to get their garages ready for spring and summer. From cleaning to conditioning, your garage will see a lot more action as the weather continues to warm. Grills, bikes, boats, and more will take the center stage, and homeowners are called to get their garages in shape for summer. Here at Blue Sky Builders, we’ve been providing advice on how to keep your garage in tip-top shape on our blog for a few years, and would like to share with you today a few handy guides on garage care and maintenance. Durability Exercise: Don’t Chance it, Check It. With garages a main point of entrance in many homes and a major activity hub for families, the garage is important—keep it safe. One of the key safety concerns of homeowners has and always be the garage door opener. This is why in late 2013, LiftMaster introduced its “Don’t Chance It, Check It” campaign urging homeowners to complete routine inspections of their garage door openers. Check the sides of the garage door for properly installed photo-eyes (black sensors), mounted no higher than six inches off the floor. Block the photo-eye with an object over six inches tall and press the close button on the garage door opener. The door should not close. 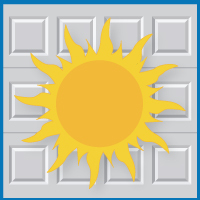 Lay an object that is at least 1.5 inches in height flat on the ground in the door’s path and press the close button. Household objects this size might be a bar of soap, stack of index cards, or a hardcover book. The door should reverse off this object. If it makes contact and does not reverse, the door is not operating correctly. For more advice on inspecting a garage door opener for safety and reliability, follow this door to floor garage door safety checklist. Think it’s time to replace your garage door? Learn the symptoms of a garage door in need of repair, and see how we can help you fix it. We’re guessing that if you’re like most homeowners, some kind of stain has crept into your garage over the course of winter. Salt, oil, grease, and more are all causes for concern, as they can contribute to the aging of a garage floor. We’ve offered many different tips for removing everything from rust to salt to tire marks from your garage floor. We also offered a deeper look into removing winter stains and restoring your garage from winter damage. Looking to prevent that unsightly stain from ever appearing again? Learn how to epoxy coat or paint your garage floor before it gets too hot and humid to do so. Whether you’re looking to store more stuff or move more effectively, if your garage looks like something out of Hoarders, it might be time to think of a storage solution. Is Your Garage Falling Apart? Sometimes in life, as in baseball, everything looks good in theory, but never pans out. If your current garage looks like it should be sent to the minor leagues, don’t hesitate to call us so that we can install a superstar of a garage for your home. Contact Blue Sky Builders today.